Newly engaged and not sure where to start? Girl, we’ve got you covered. Thinking of all of the moving parts of the wedding planning process can feel overwhelming, so we’ve created this handy 12 month planning checklist to guide you through planning the wedding of your dreams step by step. When you break down everything from venue selection to RSVP’s into smaller groups it is much more manageable. Think of this timeline as your new best friend. Planning a wedding is no small feat, especially when you don’t have a full year to plan. Say you get engaged over Christmas and have always dreamed of a fall wedding. Is it possible? The answer is: with a detailed checklist and some hard work, absolutely. 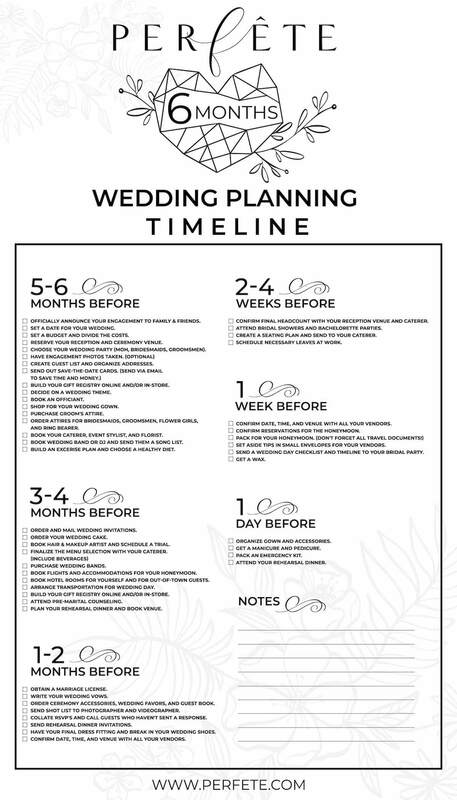 This 6 month wedding planning timeline includes all the key dates and milestones leading up to your special day. Whether you’ve got 12 months or 6 months, we recommend you have this list pinned, printed and pasted to your desktop to make sure you don’t miss a step along the way. Do you have any planning tips or tools that have been absolute lifesavers? Anything you think we missed? Let us know in the comments below!